Recently a reader who had seen an old map showing the line of the Plymouth & Middleboro Railroad asked me about it. Below is the (rather long) response. Much of the information I had noted down in one form or another and the reader's question prompted me to pull it together to create this history of Middleborough's last railroad. Despite their proximity, the towns of Middleborough and Plymouth were not linked by railroad until the final years of the 19th century, when the Plymouth & Middleboro Railroad, one of Massachusetts' last steam railroads, was built. Though operated for less than fifty years (1892-1936) before it became defunct, the Plymouth & Middleboro had a history typical of that of many railroads throughout the region. Never able to fully finance itself through either passenger or freight revenue, the railroad saw first the discontinuance of its passenger service and later its freight service which eliminated them as an (ultimately futile) cost-cutting measure. Today, little remains of the former railroad in whose right of way much of Route 44 was ultimately constructed in the mid-twentieth century. A railroad linking Middleborough with Plymouth was first proposed in the second quarter of the nineteenth century as a replacement for the infrequent and uncomfortable stages which ran between the two towns. Though the proposition progressed to the extent that a proposed route was declared feasible and a charter granted in 1849, no further action was taken and the project soon afterwards was abandoned. Despite the fear of the unknown writer that “the fractiousness of certain parties in Plymouth” might prevent such a plan, Plymoutheans appeared to favor the general idea of a west-bound railroad and three years later in 1870 the Plymouth Old Colony Memorial called for a railroad from the general vicinity of Kingston through Plympton to Middleborough. The writer of the letter advocating the proposal, merely identified as “P”, demonstrated remarkable foresight regarding the value of such a road, at least from a freighting standpoint. Construction of direct route between Middleborough and Plymouth was perceived as having a number of benefits for Middleborough. The new railroad would give Middleborough four connections to Boston: “via Taunton and Stoughton, via Brockton, via Plymouth and Whitman, and via Plymouth and Duxbury.” Additionally, it was likely that an early morning mail train would be added to accommodate both Plymouth and Middleborough. According to an anonymous Old Colony employee at Middleborough: “When the Plymouth & Middleboro railroad is completed you can reasonably expect that the early morning mail train to Plymouth may be continued on over the P. & M. to Middleboro, and not require an entirely new train from Boston …. It will not pay to run a [morning mail] train all the way to Middleboro from Boston just for Middleboro accommodation alone.” At the time, there was much enthusiasm in Middleborough for the town's increasing importance as a rail center: the Old Colony line from Brockton was being double-tracked, and both early and late trains were added to accommodate Middleborough and Brockton. At this time, the Middleboro News facetiously asked, "Why not try the Meigs elevated railroad between this place and Plymouth?" Plymouth residents were encouraged that the new railroad would help foster both industry and tourism at Plymouth. “… The Plymouth & Middleborough Railroad will redound largely to the manufacturing interests of Plymouth, while at the same time it will increase its importance as a pleasure resort. It will bring many travelers to the town who otherwise would not come.” The line would open for Plymouth (which had previously been linked by rail only with Boston) direct connections with southern New England and New York beyond, a matter “of first importance”. 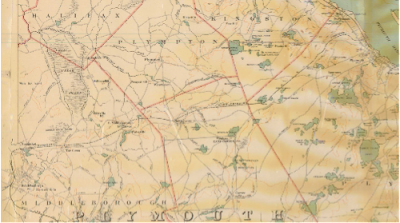 Additionally, as the shire town of Plymouth County, Plymouth would now be more easily accessible by the towns of the southern portion of the county whose residents had frequent need to travel to Plymouth on legal matters. While interested Plymouth parties held a public meeting July 29, 1882, to investigate the possibility of improved rail connections for Plymouth, no concrete proposals were forthcoming, nor was Middleborough mentioned in particular. Nonetheless, a letter in the August 10, 1882, Memorial indicated that the support of Middleborough was crucial for the success of such a project. "A new railroad is going to be built, and if Middleboro sees her interest she will arouse herself before it is too late and have a voice in directing the initiatory steps .... If Middleboro prefers to rest herself contented, expecting a new railroad is to be brought to her doors without effort on her part, we fear she will be mistaken." The writer, identified only as “Spike”, further pointed to the difficulties Middleborough might face in constructing such a railroad, particularly “the obstacles to be overcome in passing through the streets of their town at enormous expense, (no new street crossings of railroads now being allowed at grade)”. The notable Charles G. Davis (1820-1903) of Plymouth, Judge of the Third District Court, however, disagreed, arguing that it was the Sandwich connection which would prove most beneficial by locating Plymouth on a main line, although he conceded that the success of the project would be dependent upon the Old Colony’s willingness to run express trains over the line to Plymouth. As to the value of a Middleborough line connecting Plymouth with the remainder of southern Plymouth County, Davis testily disposed of that: “Oh yes! the shire town question! This is the bugbear for everything, and I am sick of it.” Additionally Davis who demonstrated a clear prejudice against the Old Colony Railroad, feared that that corporation would easily acquire control over an independent line to Middleborough built at public expense as it had with the Duxbury & Cohasset Railroad which had been chartered in 1869 and built in the succeeding years as a mainline extension today known as the Greenbush line. While Plymouth vacillated, the Middleborough committee concluded that a route which joined the existing Old Colony line at North Plympton to be the shortest and most feasible route. Towards that end, Barrows, as chairman of the committee, published in the Middleboro Gazette, an open letter "to the citizens of Kingston, Duxbury, and towns along the South Shore Railroad" which suggested the construction of a twelve-mile road linking Middleborough with Kingston, and enumerated the benefits to those communities which would arise therefrom. Meanwhile, in an attempt to discredit any alternative project which might jeopardize the Middleborough-Kingston line, both the Middleboro Gazette and Middleborough's second newspaper, the Middleboro News published articles "ridiculing ... and deprecating" the proposed Plymouth to Sandwich line. Matters continued in this fashion for a number of years until Plymouth finally came to accept the idea of a line westwards toward Middleborough. Ultimately, one of the strongest supporters of the project at Plymouth was Dr. Thomas D. Shumway. Shumway would become closely associated with the project over the nearly four years it took to organize and construct the railroad. A dentist, Shumway had “invented the process of filling teeth by the use of ivory points to consolidate the gold by a burnishing method in distinction to the use of a mallet”, and he became visible within the region by lecturing on this method and other dental topics. Shumway became deeply interested in the Plymouth Commercial Club’s advocacy of a new railroad for Plymouth. Comfortable in front of an audience from his previous dental lectures, Shumway began addressing meetings on the importance of the railroad proposal and he became the project’s most visible proponent. “The fact that the road was constructed was largely due to his endeavors, and he was made first president of the Corporation [upon its organization] and was re-elected yearly afterward”. Ironically for a railroad president, Shumway had been closely affiliated with the National Labor Party a few short years before in the mid-1880s. The Town of Carver also came to support the proposed railroad as prospects were high that the railroad would invigorate Carver’s local economy. In January, 1892, the Old Colony Memorial remarked that the town’s “prospects are much more than flattering, now that the Plymouth & Middleboro railroad is to traverse it, in its northern sections.” In February, 1892, the Middleboro Gazette reported that Dr. Shumway was “looking after the interests of a railroad connection between Tremont and some point on the Plymouth & Middleboro line.” While Shumway denied the report, stating that he “had about all the railroad he wanted at present”, the story was indicative of the continuing demand for a suitable line through Carver or West Plymouth. By the late 1880s, with a consensus forged that a line linking Plymouth and Middleborough by way of North Carver was the most practicable and potentially profitable route, survey work could begin. By March, 1889, sufficient subscriptions had been received so that a survey of the proposed route could be undertaken, which commenced on March 9. Rapidly completed, the survey was made public in late May when the directors met with the Plymouth Board of Selectmen to present plans of the proposed route as required by public statute. Two routes were considered at the Plymouth end: one via Cobb’s Swamp with a grade of 80 feet to the mile and a length of 18.79 miles which was considered the most practicable, and a second through Cold Spring which had a 130 foot rise, but was shorter at 17.56 miles. While it was the first route which initially was favored, it was the second route which would come to be built. In January, the bill chartering the Plymouth & Middleboro Railroad was passed by the Massachusetts House of Representatives, and was signed by Governor Bracket on March 23, 1890. The first public meeting of the new railroad was held at this time on March 13, 1889, at Carver. The company was organized with a board of nine directors: five from Plymouth (Thomas D. Shumway, Leavitt T. Robbins, Nathaniel Morton, W. P. Stoddard, J. W. Mixter), three from Middleborough (William R. Peirce, Eugene P. LeBaron, Albert T. Savery), and one from Carver (George F. Morse). Officers of the company, all Plymouth residents, were Shumway, President; Robbins, Vice-President; Mixter, Treasurer; and Benjamin A. Hathaway, Secretary. A week later, on March 20, the Plymouth & Middleboro Railroad Company was incorporated. Ultimately, an arrangement was made whereby the railroad was to be financed through private subscription and leased to the Old Colony Railroad. “President Choate of the Old Colony had no objections to the exceptions granted to the petitioners for the private construction of the Railroad and the operation of it by the Old Colony.” The charter for the Railroad provided for 800 shares. Included in the cost of construction were financial damages which were required to be paid to owners of property which would be taken along the route of the road. A number of properties were demolished for the construction, including the “old Holmes house beside the bridge” at Plymouth, which was torn down sometime in April, 1892, or after. Apparently there was some difficulty reaching a settlement on the amount of damages in some of these cases. In mid-1892, Charles G. Davis who had so vociferously opposed the project back in 1882 and whose houselot near the northeast corner of Court and Lothrop Streets in Plymouth abutted the new rail line petitioned the Plymouth County Commissioners with a number of others for a hearing into the matter of damages, but no decision was reported. By October, the damage issue had been settled, and Davis’ suit “for a large bill of counsel fees” was adjusted and withdrawn. From the start, the intention was that the completed railroad would be immediately leased to the Old Colony Railroad. A memorandum of agreement signed between the Plymouth & Middleboro and the Old Colony bound the Old Colony to operate the new road “for a term of ninety-nine years, paying as rental thirty per cent. of the gross receipts, and guaranteeing that this rental shall be sufficient to pay the interest on the bonds, viz., $11,250 per year.” Consequently, the Old Colony became an active partner at times in the construction of the roadway, lending both its facilities and rolling stock to expedite the construction. The route, as accepted, essentially followed the course of modern Route 44 which was constructed on much of the western portion of the railroad's right of way. Branching from the Old Colony Line between Middleborough and Boston near Keith Street, the P & M crossed Everett Street just north of its present junction with North Street. Cutting through Muttock where it crossed the Nemasket River and a relocated Plymouth Street, the line ran north of Plymouth Street, on to the Green, crossing Plympton and Raven Streets, through East Middleborough between Eddyville and Waterville where it crossed Carmel and Brook Streets, and on to North Carver. At North Carver, the line crossed Plympton (North Main) Street and continued to run north of Plymouth Street and south of High Street crossing Gate Street and running to West Plymouth where it passed between Darby and Little Clear Ponds before continuing eastward parallel with the Kingston town line through largely forested land crossing the Plympton Road and passing north of Round Hole and North Triangle Pond before reaching North Plymouth where it turned southeastwards toward the Plymouth terminus, crossing Court Street and joining the Old Colony line near Lothrop Street. The fifteen plus mile route between the two towns was determined by “Engineer Rollins of the Old Colony office force” and would involve the removal of 400,000 cubic yards of earth, and the construction of ten bridges (“four under grade bridges of iron, …five over grade bridges of wood, with one pile bridge”), fourteen culverts, and 1,500 feet of new roadway. Stations were to be established along the line at Plympton Street at the Green in Middleborough (“Putnam’s”), Carmel Street between Eddyville and Waterville at East Middleborough (“Mount Carmel”), High Street at North Carver (“North Carver”), and at West Plymouth near Darby Pond (“Darby”). The stations were named in February, 1892, by Shumway in consultation with the board of directors. The two Middleborough stations, however, were later renamed. Originally, the Green station was known as “Putnam's”, in honor of the former pastor of the Church of the Green, Israel W. Putnam. However, as goods and baggage destined for Putnam, Connecticut, frequently got misrouted, the name was changed in June, 1906, to “Nemasket”. Mount Carmel station, originally named for the rise of land north of Waterville, was renamed East Middleborough in March, 1907, possibly because most residents knew the station by the latter name and had apparently always referred to it as such. Tellingly, no station was established at Muttock in Middleborough, despite the desire for one there by local residents. In January, 1893, it was reported that Muttock residents were seeking a flag station along the line and “are likely to get it next Spring.” They never did. On January 4, 1892, construction work on the railroad officially began when president Shumway broke ground on the land of Captain Gamaliel Thomas a short distance from Court Street in Plymouth and removed the first shovelful of earth. “The implement used was a good, solid, Oliver Ames, round-pointed, steel shovel, donated for the purpose by Wm. H. H. Weston, and the spot chosen was the grade on land of Capt. Gamaliel Thomas near Cold Spring ….” In attendance were officials representing the railroad and the Town of Plymouth, Plymouth Commercial Club members, the contractors and members of the public. The first shovel of earth was later distributed at a celebration by the Plymouth Commercial Club in small keepsake boxes. In late December, 1891, “derricks, a hoisting engine and necessary tackle” had been dispatched to Plymouth for use at Court Street, and by the start of construction on January 5, 1892, the derricks had been erected, and foundation work on the abutments had begun. Meanwhile, “about a dozen” railroad cars stacked with cut granite blocks had arrived at Plymouth station, and land belonging to Captain Gamaliel Thomas was in the process of being graded. In order to perform the necessary cut and fill work at Court Street, a temporary track was laid. “A frog is being put into the Old Colony track from which to lay temporary rails to and across Court Street, and over this track the engine, shovel and [19 dump cars] will be taken to the big hill which is to be attacked.” Work on the Court Street project was sublet to Leavitt, Dailey and Crockett of Boston and was expected to take as long as construction of the entire remainder of the railroad. Despite stormy weather in January, 1892, work progressed quickly. The brook near Court Street was redirected through a newly constructed stone culvert under the proposed railway bed. More exciting for spectators was the arrival of the locomotive to be used in the construction work from Fay & Scott of Dexter, Maine. The locomotive and dump cars “were towed through as freight, the engine being disconnected and driving wheels and piston rod and connecting rods being stowed in the cab.” Given the steep grades on the project, only a short train of cars could be used. The steam shovel arrived next, disassembled on three flat cars. “The machine is very similar to a ‘scoop’ dredge on wheels. Its bucket will hold more than enough to fill an ordinary dump cart, and is armed with enormous teeth.” The shovel was to be assembled and in working order within ten days, and would be put to use immediately as work on the cut was required to be completed by April as the steam shovel was engaged elsewhere after that date. The steam shovel was a marvel to all who came to witness it in operation, beginning the first week of February. Each shovel equated to 48 cubic yards of earth and a mere two loads were enough to fill the Old Colony dump cars in use on the project while the other dump cars were able to accommodate three to four loads. While the shovel worked admirably, the locomotive (known as “Old Sarah”) proved troublesome. A hole in the boiler allowed water to leak into the fire box, and repairs were required before it was found that it could not be used. Subsequently, a second locomotive, “No. 17, D, of the Old Colony road” was requisitioned and was put to use in mid February. The performance of even this engine was erratic. “Although a much more powerful machine it is only capable of handling four dump cars on the Court Street grade, backing down ahead of them and pushing them up. It gets stalled occasionally on the return with the empties, having to start at the foot of the grade with its load all uphill before it. The machine also has derailed a number of times on account of being too long for the curves, and a shorter switching engine is to take its place.” Additionally, six of the 19 dump cars were received damaged and had to be repaired on site. By mid-March, half of the length of the cut had been traversed by the steam shovel, though “more than half of the material to be removed, remains ahead”. Initially, the soil was described as easily excavated, “being like yellow sugar, covered with a little over a foot thick, of frozen earth, which has to be broken up small enough to go through the shovel.” Deeper into the high ground, however, the earth was found to be harder, “mixed with clay and small stones.” In order to hurry the process, work was carried out round the clock, with the excavated earth being used for fill on the east side of Court Street. Through April, the shovel was progressing at the rate of eight feet daily, and new dump cars obtained from the Old Colony Railroad were substituted when those previously in use by the contractors were sent to a job elsewhere. Not all the excavation work was mechanized. The initial smaller cut was made by laborers working on either side of the hill who created an initial cut which the steam shovel would deepen. In April, as the steam shovel inched westwards, a gang of men continued to dig manually eastwards steadily closing the gap between themselves and the steam shovel, three feet of earth separating the two operations. Meanwhile by mid April, much of the fill work had reached completion, and work focused upon filling the meadow to the east of the bridge and a “little hollow” to the west. Throughout the spring, however, the fill deposited in a swamp beyond the cut on the west side of Court Street continued to settle. In mid-May, only one hundred feet of earth separated the diggers from the steam shovel near Centennial Street, and work was focused upon completing the remainder of the cut as quickly as possible, with “all energies directed to the front.” Excavation, in fact, did move rapidly. “It takes about three and one-half minutes to load a car, attach it to the train, and place an empty car alongside the shovel.” Finally, on the night of Sunday, May 22, the remaining earth in the cut was breached. The steam shovel was immediately disassembled and shipped to Ashland, where it was long overdue. While this work was being undertaken, construction of the iron bridge over Court Street went on apace. First constructed was the western abutment with excavated earth being dumped towards Court Street to create an embankment. In late February, work on the eastern abutment was begun. By mid-March, the bridge girders had been received and could be seen waiting in the Old Colony track yard at Plymouth. Filling next to the abutments continued through March and April and by early April, the fill level had reached the height of the bridge on the east, while work was continuing on the west side of Court Street. Strangely, little notice seems to have been given the installation of the iron bridge girders which appear to have been in place by early April at which time the first test of the new layout occurred when an open car on the Plymouth & Kingston Street Railway was run under the bridge in order to determine whether there was sufficient clearance. “The result showed the electrics would just barely squeeze through. The P. & M. Co. will lower the street in accordance with the decree of the County Commissioners, about eight inches, which will better matters. [Superintendent C. E. Barnes of the Plymouth & Kingston] doesn’t want any more lowering done than is absolutely necessary, as it means more power will be needed to climb the grade.” In late April, the bridge was considered complete enough that it was being used by the engine which was transporting earth to the east side of Court Street where it was used to fill the meadows between the street and the Old Colony line. At the Middleborough end, the first five mile section of track was sublet for construction and work commenced on January 4, 1892. “Contractor McCarthy sent out fifty men to Middleboro Monday morning, teams having already preceded them, and they struck in with good will.” The work at Middleborough was reportedly overseen by Lyman P. Thomas (1861-1929) of South Middleborough who was employed by the Old Colony and had previously worked as a construction and maintenance engineer with the Sante Fe Railroad. The initial work at Middleborough involved clearing and grading the route north and eastwards from the Middleborough terminal. The proposal was to keep as large a force as possible engaged upon the project throughout the winter in order to advance the project as rapidly as possible. The largest project at Middleborough involved the Nemasket River which was to be crossed by a 180 foot long wooden pile bridge to be built by architect Colonel Earl E. Ryder who had a long association with the Old Colony Railroad as designer of many of their stations. By mid-May, track laying had progressed from the Old Colony line eastwards through Muttock and “passed the depths of ‘Meeting House Swamp’”, reaching nearly to the Green, with the road bed being surfaced with gravel. Meanwhile, work was being done on grading the proposed station sites at the Green, East Middleborough, North Carver and Darby. Work was also undertaken at the Middleborough railyard in order to create a direct connection between the Plymouth & Middleboro and the Taunton branch. Such an arrangement would facilitate through trains from Plymouth to Providence and New York. An interlocking switch system controlling trains approaching from the north was installed during August, 1892, and would permit “Plymouth & Middleboro trains to be sent safely across the Old Colony track on the way to Taunton and Providence.” No provision, however, was to be made to connect the new railroad directly with the mainline to Boston. Passengers and freight would be required to switch trains at Middleborough. Another change which was required was the relocation of portions of Plymouth, Precinct and Nemasket Streets. As laid out, the railroad would have crossed Plymouth and Nemasket Streets, creating the need for two separate bridges as the state prohibited at grade crossings on newly-constructed railroads. In order to eliminate this, “portions of Precinct, Plymouth, and Nemasket streets are discontinued, and a new street opened from Precinct to Nemasket streets. This leaves the [Muttock] school to one side, and the building is to be moved to a more accessible location.” One bridge, over what became Plymouth Street was constructed. Similarly, the westernmost end of North Street was shifted to the southwards at its intersection with Everett Street. With the completion of the big cut at the close of May, 1892, track laying operations were relocated to Plymouth, the line having reached Waterville in Middleborough. A gang of 35 men who had been previously engaged in the work at the Middleborough end arrived at Plymouth to commence operations there at the “end of the construction track in the long cutting” on May 26. “Sleepers and rails are being conveyed by the construction train to that point, and from there distributed along the line, the cars following as fast as the track is completed…. The sleeper gang works nights, and the rail layers days.” Within a week, two and a half miles of track had been placed, and progress advanced so quickly that the last railed was anticipated as being in place by June 28. An informal ceremony was planned for the laying of the final rail, with officials and stockholders being conveyed to the site by train where the last rail would be placed. Following this, the party would continue on to Mount Carmel station in East Middleborough “where the people of the neighborhood will spread a collation in a grove, and there will be a little jollification.” The final rail, in fact, was delayed until July 1, and was placed about a mile east of Mount Carmel just west of Brook Street. “A working train took the party of about 30 from [Plymouth] on flats on which settees were placed, and a dozen or fifteen more persons were picked up at North Carver.” A party of about 100 individuals took part in the ceremonies which witnessed the ceremonial driving of the last spikes by Nathaniel Morton, president of the Plymouth Commercial Club; John J. Russell, director of the Old Colony Railroad; Fred Austin Ward, chairman of the Carver Board of Selectmen; Captain Albert T. Savery, chairman of the Middleborough Board of Selectmen; and Charles S. Davis, chairman of the Plymouth Board of Selectmen. Following a brief address by Reverend Ernest W. Shurtleff, pastor of the Pilgrimage Congregational Church of Plymouth, president Shumway stepped forward to drive the final spike whereafter three cheers “were given with hearty good will.” Following the ceremony, the train continued through to Middleborough arriving at 4:40 PM, the first passenger train to arrive in town along the new line. Following this, ballasting and leveling of the road would need to occur, as well as an inspection by both the Railroad Commissioners and the Old Colony Railroad, before the railroad could be opened. Throughout August, “quite a force” was engaged in ballasting, “and a gang of experienced ‘tampers,’ from the Old Colony is smoothing up and putting things in readiness.” On October 11, “railroad commissioners Dale and Stevens and engineer Swain, President Charles F. Choate [of the Old Colony Railroad], Master of transportation Sanborn, Division Superintendent E. G. Allen, Division Master E. H. Bryant, Master Mechanic Willis, and other Old Colony Railroad officials; together with President T. D. Shumway, Director N. Morton, and others of the Plymouth & Middleboro R. R. Co., started from [Plymouth] about 10.15 A. M. to view the last named railroad corporation’s tracks.” Though the day had begun unpropitiously when the special train which carried the officials from Boston struck and killed a pair of horses at Harrison Square, the remainder of the day came off without a hitch. A thorough examination of the track, road bed and switches was made following which “a nice lunch” was enjoyed at the North Carver station, served by D. H. Maynard of the Samoset House of Plymouth. My father, grandfather, John Parker, and many others in [Carver] worked for these contractors. Their pay was ten cents per hour, and they usually worked ten hours a day. They leveled the hills, filled in the hollows, and put in culverts at Brook Street, Shaw’s Crossing, Lakenham Brook, and at several places in Darby….My grandmother, Mary Braddock, earned extra money by cooking for the railroad workers. She made her own butter and cheese, baked a dozen or more loaves of bread a day, apple pies, and four pots of beans on Saturday, and who knows how many dozens of doughnuts. The men would stop at the house and buy what the wished. She charged ten cents for a loaf of bread, a pie, or a dozen doughnuts. She also sold eggs. Sometimes eight and sometimes ten. Work on such projects for the manual laborers could be dangerous, and at least two fatalities were reported during the construction of the line. The first fatality was Daniel McGeary of Boston, who died following an explosion involved with rock blasting at Tinkham’s Bottom at Plymouth. An employee of McCarthy Brothers, McGeary on January 27 was in charge of the blasting. When a charge failed to detonate, McGeary worked to draw the charge when it exploded, “shatter[ing] the rock and horribly mangl[ing] him.” The Old Colony Memorial provided a gruesome account of McGeary’s injuries from which he died, after having been taken to Boston that same afternoon. On June 3, a second fatality occurred at Middleborough on the siding just south of the Clark & Cole lumber mill on Cambridge Street when an unnamed Italian laborer was killed. While it was the efforts of these laborers who made the railroad a reality, typically it was the contractors, McCarthy Brothers, who received the greater credit at the time. The proposed opening date for the railroad (and with it the date of a formal celebration), however, was continually pushed back from September 1 to October 17 to November 14 and finally to December 1. A delay in furnishing the completed stations in Middleborough still further postponed the opening of the railroad beyond December 1. Finally, on Monday, December 5, the railroad was opened for business by the Old Colony Railroad which four days earlier had officially leased the Plymouth & Middleboro for a term of 99 years in accordance with its earlier agreement. …There was no oration, no ceremony, no parade, no band, nothing except a very glad party and a business-like way of running things generally. 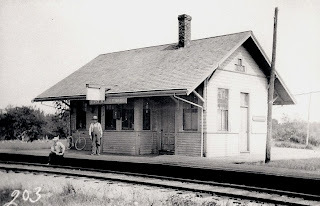 On Monday morning at 8.45 o’clock engineer E. Mellen and fireman J. Mitchell started their coal fed iron steed from the Old Colony station here, with a smoker and two passenger coaches attached in charge of conductor E. E. Perry, baggage-master W. Snow, and brakeman J. McNaught. The train was numbered 594 and had 159 passengers from [Plymouth], all bound for a first trip over the Plymouth & Middleboro Railroad on the occasion of its being opened to public travel. The first through ticket was sold to Thomas Jackson, who retains it as a souvenir. The proposed formal ball to celebrate the opening never occurred. Instead, the Plymouth Commercial Club, on January 4, 1893, hosted its Middleborough counterpart to a ball at Odd Fellows Hall in Plymouth. About 250 attended the evening which consisted of dinner catered by D. H. Maynard of the Samoset Hotel of Plymouth and afterwards dancing to music provided by Damon’s Orchestra. Middleborough returned the favor on March 15, with a similar banquet held at Middleborough Town Hall hosted by the Middleboro Commercial Club and catered by S. S. Bourne of Middleborough, followed by dancing until midnight. Though flat cars loaded with passengers had passed over the road on July 1, 1892, from Plymouth to Middleborough, the first through passenger train traveled the railway on September 27, carrying about 30 people associated with the Plymouth & Middleboro corporation in a car borrowed from the Old Colony. The train departed Plymouth at 10:07 and reached Middleborough 55 minutes later after stopping at all stations along the route. After meeting in the west room of Middleborough Town Hall and touring the building “in which Middleboro has such just pride”, the committee returned to Plymouth. The first public passenger trains were inaugurated on the road on December 5, 1892, and the original schedule for the line called for three trains each way daily. There are to be three trains a day each way, Sundays excepted, all of them running through between Providence and Plymouth, so the people of that city, if they care to do so, can go to Boston by way of Plymouth….The running time between Plymouth and Middleboro, will be thirty-five minutes. Trains leave Plymouth at 8.45, 11.35 A. M., 4.10 P. M., and return from Middleboro at 9.38 A. M., 1.38 and 6.00 P. M. [Old Colony Memorial, “To Middleboro”, December 3, 1892, p. 4]. The passage indicates that proponents may have been over optimistic, particularly thinking that Providence residents would travel to Boston by way of Plymouth, a route which would have added considerable expense and time to their journey. Tourists did begin making their way to Plymouth as well. In July, 1893, a Sunday School excursion from Middleborough traveled over the railroad to Plymouth in order to see the historical sites and to enjoy a harbor sail aboard the Stamford around the Gurnet and a scenic ride along the electric street railway from the Hotel Pilgrim to Kingston. “…We hope … our Middleboro friends will have a most delightful time and be glad that they have assisted in making this short railroad cut from their beautiful home town to the Pilgrim shore. Now that old Nemasket has shown the way wouldn’t it be strange if other towns in Plymouth and Bristol counties followed the example.” The mid-1890s at Plymouth saw a “large number who … crowded the hotels and filled the town all summer, as never before”, a development attributed to the railroad. In 1900, the schedule was altered. Commencing January 8, 1900, the 9:24 A. M. train from Middleborough was rescheduled to leave at 8:09 A. M., stopping at Putnam’s, 8:16; Mount Carmel, 8:21; North Carver, 8:26; Darby, 8:31 (flag), due Plymouth 8:40 A. M. Additionally, the 4:20 P. M. train from Plymouth was rescheduled to 5:20, stopping at Darby, 5:29 (flag); North Carver, 5:35; Mount Carmel, 5:40; Putnam’s 5:45; due Middleborough at 5:51 P. M. Improvements to the Sunday schedule were made in early spring, much to the pleasure of most riders with a train being added to Providence, departing Middleborough about 10 A. M. “This will allow people so disposed to take in the clambakes down the Providence river, to see a basketball game at Rocky Point, or to enjoy other attractions in that section…. It is not questioned that it will be a decidedly popular train.” This, no doubt, was the special excursion train recalled in later years by Lyman Butler. Yet despite these changes, passenger traffic on the railroad steadily decreased over the course of its history, largely due to the competition represented by the automobile. By 1918, the railroad was running only two passenger trains daily, and one on Sundays. “For Plymouth 8:40 a. m., 6:55 p. m. Sundays 8:40 a. m. Leave Plymouth 7:10 a. m., 5:35 p. m. Sundays 5:35 p. m.” During the summer, the mid-afternoon train was restored. When it was constructed in 1892, the Plymouth & Middleborough Railroad was intended, primarily for passenger traffic. Despite this initial intention, the line, in fact, was used primarily as a freight line throughout its history, with at least one daily freight train. Amateur Middleborough historian Lyman Butler later recalled of the Plymouth & Middleboro: "At the peak there were three or more cars on the passenger train and real long freights. I used to see freight so heavy that they required two engines." Freight, however, received a slow start on the new road. While through freight for Providence and New York was shipped almost immediately from Plymouth, no freight was loaded during the first week of the railroad’s operation at any of the four way stations. The volume of freight traffic, however, would shortly thereafter increase dramatically. Freight originating in Middleborough was mostly west-bound freight received from the two way stations at the Green and Waterville. Much of the freight which passed over the line in Middleborough was agriculturally-based, consisting to a large extent of boxboards, cordwood, slabs, boxes, box shooks, cranberries, milk and ducks. One Middleborough firm making heavy use of the line was Clark & Cole, producer of wooden shipping boxes, including boot and shoe boxes, which operated a steam mill on Cambridge Street in Middleborough, and a second mill at North Carver. In 1893, the company purchased a woodlot on Plymouth Street just west of the Green, but didn't begin making large-scale purchases of wood lots near the rail line until 1905, purchasing twenty-two parcels of land between that year and 1909, the year the company was forced to file for bankruptcy. At its peak, Clark & Cole sawed a million board feet of lumber a year, shipping three railroad cars of boxes to Boston daily, a large proportion of the logs producing these boxes having passed over the Plymouth & Middleboro Railroad. Lumber from other mills, including that of Albert T. Savery at Waterville, made its way over the line, as did finished wood products, as well. Many of these goods originated in the California Mills on Prospect Street in Plympton, just over the Middleborough town line at the foot of Soule Street and were shipped from East Middleborough. From January 1, 1892, the California Mills were operated by Asaph F. Washburn (1845-1935) of East Middleborough, and his son-in-law, Edwin E. Soule (1868-1952) as Washburn & Soule. The firm produced box shooks which were shipped to Malden via Middleborough. The mill also made cedar cranberry barrels, as well as half, third, and quarter barrel cranberry boxes over the course of its existence. The mill survived the railroad by five years only. It burned in 1941, and declining business did not warrant its rebuilding. Agricultural produce was shipped on the line, principally cranberries from East Middleborough and North Carver, site of one of four screenhouses of the New England Cranberry Sales Company. One of the more unusual agricultural products shipped over the railroad were the thousands of ducks shipped annually from the farm of Charles H. Soule located off Cedar Street in the Soule Neighborhood of East Middleborough. Created on eight acres of land purchased from Horace Soule in 1899, the duck farm produced some 12 to 15,000 ducks annually which were shipped by express from the Mount Carmel station. The late Alberta N. Soule recalled: "After picking, the ducks were placed in large barrels with plenty of ice, and early the following morning they were packed for market. The poultry arrived in Boston for market the morning after it was dressed." Charles Soule abandoned raising ducks about 1916-17, due to a poor market, but later raised turkeys. To support these operations, grain was hauled over the line “by the carload” to the Mount Carmel station. In 1910, C. P. Washburn, a Middleborough grain dealer and a summer resident of Waterville, purchased a strip of land adjacent to the East Middleborough station with the intention of constructing a grain house and siding. “When this is completed it will prove a decided convenience for those residents of that section who use large quantities of grain.” Although such an operation would have greatly convenienced the East Middleborough poultry raisers, unfortunately it was never built. Also carried over the line were hoops and staves, presumably for Washburn & Soule, and, in 1896, plumbego, or black lead, mined in Nova Scotia, landed at Plymouth and destined for the Parlor Pride Manufacturing Company in Middleborough, which manufactured stove polish. This latter freight showed the importance of the rail line’s connections with ocean-going vessels. The heaviest user appears to have been Plymouth itself, not surprising since the railroad provided direct connections with the west and ultimately New York. A drop in freight rates for goods shipped to or received from points west of the Harlem River terminal in New York at the start of 1894 further stimulated business at Plymouth. “The freighting at [Plymouth] is considerable either way, with Boston and New York, and it is quite often the case that two locomotives have to be put on to take the heavy trains up the grades on the Middleboro road as far as North Carver. The yard [at Plymouth] is full all the time of cars, and it is getting to be a problem what can be done to make more room when times get good again.” More humorously, the Old Colony Memorial reported at the time that oysters were able to be dispatched from Wareham within two or three hours to Plymouth by means of the railroad. “By this arrangement we have better oysters than ever before …. Dr. Shumway is entitled to [an oyster] stew at the town’s expense.” The railroad did, however, enable Plymouth residents to receive fresher goods more frequently than by means of the roads. Plymouth’s ability to substantially weather the economic downturn in the 1890s was also cited as a consequence of the railroad. “The Middleboro Railroad … was a great factor in this prosperity.” One of the heaviest Plymouth users was the Plymouth Cordage Company, the world’s leading producer of rope, which was an early supporter of the project (Cordage company treasurer G. F. Holmes spoke on the “Business Men of Plymouth” at the celebratory banquet on January 4, 1893). In August, 1902, an additional freight train was put in commission on the line in order to accommodate the Cordage Company which had considerable business in the west. The train was to run through via Providence. Frequently, the Cordage Company ran large trains. One such train which passed through Middleborough enroute to Providence and consisted of two engines drawing 36 cars filled with rope. As early as 1882, the Robinson Iron Works of Plymouth, a manufacturer of nails and nail plate, had supported improved rail connections for Plymouth. At a public railroad meeting held July 29 of that year in Plymouth, James Miller, Treasurer of the iron works, had asserted that “the future growth and increased prosperity of Plymouth largely depends on additional railroad accommodations and new railroad connections.” Demonstrating the value of the new road for the company (which after 1890 produced nail plate only) were the nineteen carloads of iron which passed over the road to the firm’s Plymouth plant on March 23, 1893, “instancing the convenience of this new freighting thoroughfare, to one of [Plymouth’s] large manufacturing concerns. Western bound merchandize gets out that way likewise with considerable more facility than by the old route through Boston.” Other large freighters undoubtedly included the Puritan Mill of the American Woolen Company. In West Plymouth, Darby later became a busy station with freight, primarily milled lumber and logs from the Clark & Cole mill. “Darby station is a very busy place just now. A great number of logs are being shipped every day,” reported the Memorial in May, 1904. 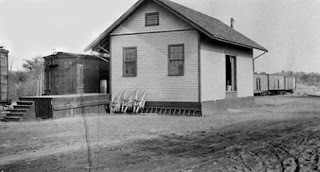 July, 1906, witnessed “as high as 80 bushels of blueberries” being shipped from the station in a single day. Carver, too, saw not inconsiderable freight pass through its small freight house. North Carver, as well, reported heavy freight traffic in spring of 1906, “a double header every day and sometimes three engines being necessary to haul the cars.” Trains drawn by two and three engines were a common sight. While freight carried on through trains to Taunton, Providence and beyond posed no difficulties, the additional freight carried by the line created additional work and congestion at the Middleborough terminal for freight requiring transfer to Boston-bound trains. Following the turn of the century, considerable congestion was experienced at Middleborough in its freight yard, partially due to the increased volume being shipped to and from Plymouth and Carver. While proposals called for the creation of a new larger freight yard at Depot Grove (the land now occupied by the Middleborough Veterans’ of Foreign Wars Post on the east side of Station Street), the expansion was not warranted when freight receipts began to decline rapidly throughout much of the Old Colony system as the decade progressed. Despite the volume of freight on the Plymouth & Middleboro Railroad, it was not enough to offset the expense of operating the line. Among the reasons for this was that the express rate for freight to Providence from Plymouth was twice that of freight sent via Boston which cost fifty cents per hundred pounds and express goods, not surprisingly, tended to be shipped through Boston. Tellingly, at the hearing before the state Railroad Commissioners in December, 1911, it was remarked that “the road has never earned enough to pay interest on the bond” issue. Woodland fires were a frequent and serious threat to the pinelands of North and West Plymouth, Kingston, North Carver, Plympton and East Middleborough. The biggest culprit after 1892 was the Plymouth & Middleboro Railroad whose steam locomotives produced drifting sparks capable of setting ablaze tinder-dry woodlands. In 1921, State Fire Warden M. C. Hutchins attributed thirty to forty percent of forest fires to steam locomotives. Locomotive-spawned fires tended to be seasonal, not appearing before Memorial Day when the woods remained damp. One of the earliest and most serious of these woodland fires along the line of the Plymouth & Middleboro occurred Sunday, July 17, 1892, “north of the first overhead bridge not far from Parting Ways. It ran across the railroad, and made quick time for “Little Italy,” the railroad laborer’s settlement at Tinkham’s Bottom.” Though the fire was extinguished, stong winds rekindled it the following day and ultimately some 2,500 acres were burned, including 1,700 acres of good standing timber. On July 5, 1894, a spark from the 11.25 Middleborough-bound train ignited dry leaves and brush near the home of Andrew Burns near Little Clear Pond in Plymouth. The fire spread rapidly and split into three separate fires which moved south and east in a mile wide front. Eventually the fire was brought under control, though a large tract of good-sized pine standing timber was lost. Yet another serious woodland fire on May 30, 1900, was touched off by a drifting spark from a passing locomotive, and burned a substantial portion of land immediately east of Putnam station. “It overran dense woods and pasture land for several hours, and the railroad station was only saved by hard work. Grover Bennett had valuable oak and pine standing timber destroyed.” Again, in mid-August, 1900, Putnam station came close to being burned from sparks. The platform was reported as having been “considerably burned.” In early May, 1902, still another fire originated Putnam, this time burning three miles towards Halifax. Clark & Cole lost 500 cords of cut wood and logs, and 700 acres of standing timber for an estimated loss of $5,000. Once more the cause was attributed to drifting sparks. A three-day forest fire was ignited May 5, 1905, “after the east bound freight of the Plymouth and Middleboro Railroad pulled out of Darby.” The same afternoon after the Middleborough freight had passed, a second fire was sighted “along the track west of North Triangle Pond, and southeast of Monk’s Hill.” The combined fires which burned over portions of Plymouth, Kingston, Plympton and Carver, were battled by 1,000 men sent by the N. Y., N. H. & H., as well as the older students of the Carver schools. $75,000 in standing timber was lost. Two additional fires near Darby station started on May 11: one on the south side of the tracks at the station which burned over a few acres towards Little Clear Pond, and a “second blaze started about half way between Darby and the Plympton carriage road bridge.” Although no source was attributed as to the cause of the fire, it was likely drifting sparks from either a locomotive or the earlier fires for which the P & M was responsible. Because of the enormous liability to itself, the railroad was keen to reduce the number of and damage from fires arising from their locomotives, particularly after 1909 when the Commonwealth made railroads liable not only for any damages resulting from a locomotive-spawned fire but for the costs incurred by communities in extinguishing such fires as well. Spark arrestors were adapted to engines and were ultimately required by state law. In early 1911, the N. Y., N. H. & H. was testing an oil-burning locomotive on the Cape Cod branch. One particular advantage was the elimination of sparks. “There are no sparks to be blamed for setting woodland fires and this alone it is calculated will save the company much money, hitherto paid in damages.” The adoption of these and other practices helped reduce woodland fires along the line between Middleborough and Plymouth throughout the early twentieth century. Another serious source of concern (and liability) for the railroad were the periodic accidents which occurred. Fortunately, only a single fatality seems to have occurred during the forty-four years following December 5, 1892, when in the railroad’s second month of operation Albert F. Reed of Middleborough was struck and killed by the Middleborough-bound passenger train near the Clark & Cole mill on Cambridge Street during the late afternoon of February 7, 1893. Frequently, service was delayed due to mechanical problems on the road. In September, 1903, a series of mechanical failures occurred on the road. “The engine on the first outgoing train broke its guide some distance up the road from Plymouth, and reached there under difficulties. A telegram was sent to Boston for another engine, which arrived in time to take the 11:20 train to Middleboro. On the way [there] the second engine broke its rocker arm and had to be laid up, while a third engine was called into service to make the trip to Providence.” Trains were delayed on July 17, 1909, when the engine on the afternoon passenger train broke down just east of North Carver, and did not arrive in Middleborough until 6:30. Storms, as well could delay traffic on the road. A severe storm in March, 1912, washed out sections of the track bed and the line was deemed unsafe with the Plymouth trains being rerouted through Whitman and Bridgewater. Winter, too, could also delay trains. Throughout the lifetime of the Plymouth & Middleboro, a number of improvements were made to facilities along the road. In the summer of 1899, alterations were made at the Plymouth which resulted “in more track room, and more convenience for passengers using the Middleboro and Providence trains.” That same year, “the new platform of crushed stone around the depot” was completed at North Carver and was reported as “a decided improvement in looks and convenience to passengers.” (Residents at North Carver, however, were still looking for a telephone to be installed at the station, petitioning for one in 1905). In Middleborough, the pile bridge over the Nemasket River was replaced in spring of 1912 by an 80-foot cement arch bridge. At the time of its replacement, the pile bridge was being “carefully watched … to guard against accidents” as “its years of usefulness [had] nearly passed.” Interestingly, the pile bridge had been cited by some as the reason for the small herring catch that year in Middleborough. Vibrations from passing locomotives transmitted to the river by means of the piles were alleged to have deterred the fish from coming further upstream to spawn. Similar concern was shown towards the structural condition of the bridges at North Carver and in 1915, both the bridge at the North Carver depot and the one below at “Old Gate” [Gate Street] crossing were overhauled, with new girders being installed and the surfaces replanked. Nine years later, the wooden bridge at the North Carver station caught fire in the early evening of July 30, 1924. “A spark from a locomotive in the afternoon evidently lodged on the under structure and started a fire which burned one side of the large stringers …. The wood was as dry as tinder and the fire was burning briskly.” Engine 1 from Middleborough responded and quelled the blaze with no significant damage to the bridge. In 1911, the towns of Middleborough, Plymouth and Carver moved to dispose of their controlling interest in the Plymouth & Middleboro Railroad by selling their 750 shares of stock to the N. Y., N. H. & H. which had operated the Plymouth & Middleboro under a lease agreement with the Old Colony since 1893. A special town meeting was held at Middleborough on July 31, 1911, and a motion made “That the town sell or dispose of its shares of the capital stock of the P. & M. to or in the interests of the Old Colony railroad company or the New Haven company upon terms which shall secure to the town not less than $76 in cash for each of its said shares ….” The town was motivated to take action due in part to the fact that the New Haven held an option to take over all the stock in 1917 by buying at par value, while the bonded indebtedness (for which the town would be partially responsible for as a quarter owner of the railroad) began coming due in 1912. The Plymouth & Middleboro, while considering how the bonded indebtedness was to be paid off, consulted the New Haven which expressed a willingness to pay the current value, $76, for the stock, thereby acquiring the railroad and the railroad’s debt. In the event that the New Haven offer was not accepted, the town faced the prospect of making good on the bonds beginning in 1912 at which point the stock was likely to become valueless. The town accordingly voted without dissent to the motion, Plymouth already having accepted a similar offer. Middleborough received $15,700 in proceeds from the sale of its P & M bonds, while Plymouth’s initial investment of $50,000 was valued at about $38,000. One of the proposals which threatened to jeopardize the financial well-being of the Plymouth & Middleboro Railroad in the early 20th century was the possible construction of an electric street railway between the two towns. Proposed on several occasions, the line was again agitated for in late 1901, receiving much support in North Carver. The proposed route was “likely to follow the Plymouth, Carver, Middleboro carriage road.” While no such line was ever built due to the recognition that there were not enough passengers to warrant the service, in 1920 a “jitney line” between Middleborough and Plymouth was put into commission with two round trips daily. Additionally, in 1922, the Plymouth-Middleboro auto-bus line started in operation on May 29 and was managed by Ruel Thomas of North Carver. The line was touted as having “the neatest equipment of any passenger line running hereabouts … a 20-passenger Reo bus with cane seats.” The bus service prospered for a time, in part because it provided Carver students who attended Middleborough High School a convenient means of transportation. Encouraging patronage on these competing lines were decisions taken by the management of the New Haven road which failed to take into account local needs. In January, 1922, the schedule of the morning steam train from Plymouth was advanced by fifteen minutes which “made [for] very poor connections with the Boston bound trains and meant a stop at the Middleboro station for nearly an hour” for North Carver residents who traveled to Boston via Middleborough. Following complaints by North Carver residents and through the efforts of Representative Frank E. Barrows of Carver, the railroad altered its schedule to better account for connections with the Boston trains. Nonetheless, the New Haven Railroad appeared to continue to ignore local needs in the compilation of its timetables throughout the 1920s. Though a representative of the New Haven at the time emphasized the company’s need to curtail train services “because of the general falling off in local travel, due largely to the automobile”, the inconvenient coordination of trains of the Plymouth & Middleboro with other lines frequently compelled riders to find alternative methods of transportation. John J. Fleming, who in September, 1924, corresponded with the New Haven, attempted to bring this matter to the railroad’s attention, specifically citing the case of the Plymouth & Middleboro. 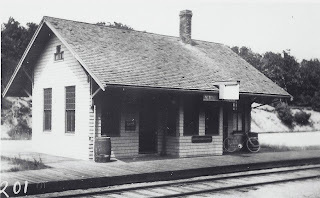 At the time Fleming’s futile correspondence, the East Middleborough station had already been closed for five years since March, 1919, and Darby had been a flag station since earlier that spring where passengers wishing to board the train were required to signal it to stop by means of a flag. In a further effort at least to reduce costs, if not improve service, the New Haven replaced the steam cars on the line between Taunton and Plymouth with gasoline-powered cars which began to run on the rails in late 1924. “They are equipped with a baggage compartment and will seat 35 passengers. They are operated by two men and a considerable saving is effected over the steam method of operation.” Lyman Butler remembered: "The trains gradually got smaller until there was just a combination baggage and passenger car. The road bed was neglected; there was not much to spend for maintenance. Even the freights were reduced to two or three cars, sometimes only one and the caboose. The last I saw was a small engine, a 2-4-0, and a caboose." The Old Colony Railroad and its lessee, the New Haven Railroad, were confronted with plummeting freight revenues and dwindling passengers throughout the post-World War I period. The Old Colony estimated that it was being operated along with its leased line, the Boston & Providence Railroad, at a $2.5 million annual loss which it found “entirely chargeable to the unprofitable suburban passenger service.” In order to bring financial order to its chaotic operations, the Old Colony took the step of drastically reduced services, closing stations and entire lines altogether. Among them was the Plymouth & Middleboro where passenger service was discontinued in 1930 and freight service six years later in 1936. On August 2, 1937, the trackage between Plymouth and North Carver was officially abandoned, while the remainder was abandoned on January 21, 1939. The stations at both Nemasket and East Middleborough were sold. The East Middleborough station was relocated to a cranberry bog at Warrentown in Middleborough, while the Nemasket station was similarly located to a cranberry bog as well where it later burned. Ellsworth C. Braddock of North Carver acquired the Plymouth & Middleboro’s depot there which was remodeled into a private home. 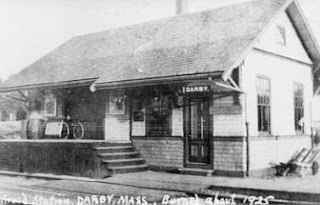 The fate of the Darby station was the same as that of Nemasket – it burned. Later, when Route 44 between the Middleborough Rotary and North Carver was constructed, it was built within the Plymouth & Middleborough’s former right of way for much of its route. Little consequently remains of the railroad west of what is now North Main Street in Carver. East of the former North Carver station, however, a considerable portion of the railroad bed remains for a considerable distance beyond Darby Pond, and its course is readily discernible on aerial photographs of the region. Also keeping alive the memory of the Plymouth & Middleboro are the reminiscences of older residents, some of which have been left on record for posterity. Following is an excerpt of an undated letter from Arthur Robidoux of Middleborough to Charlie Conrad recounting his memories of the Plymouth & Middleboro Railroad. I remember those happy days in Charlie Conrad’s sandbox and yes, we could hear the train whistles from the old Middleboro-Plymouth rail line. I recall seeing the Plymouth passenger train standing near the canopy of the Middleboro depot in the 1920s. Later that steam train was replaced by a motor car or bus, my father said, and ran awhile on that Middleboro-Plymouth line until it was replaced by a road bus, Miss New England, that ran from Middleboro to Plymouth along [Plympton and Plymouth Streets]. A fellow named Guertin operated the motor bus and it was running for some time. A later replacement was the Interstate Bus out of Taunton to Plymouth …. “Map of the New York, New Haven & Hartford Railroad, Cape Cod Division – Old Colony System,”, detail, (Boston: Rand Avery Supply Co., 1896). The route of the Plymouth & Middleboro Railroad is highlighted in red. 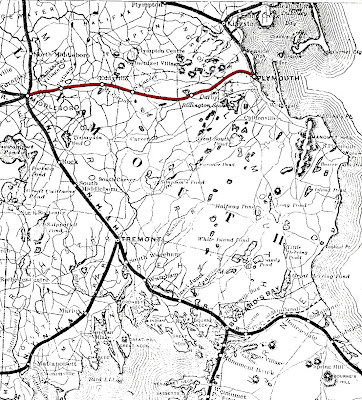 Prior to its construction in 1892, alternate routes linking Plymouth to Middleborough (via Kingston), to Tremont, and to Sandwich had been considered. Proposed Route of the Plymouth & Middleboro Railroad, Massachusetts Atlas Plate No. 7, map detail, 1891. The route of the proposed Plymouth & Middleboro Railroad appears clearly on the map published a year before the road's construction. Putnam's (Nemasket) Station, Plymouth & Middleboro Railroad at Plympton Street, Middleborough, MA, photograph, c. 1900. The Nemasket, Mount Carmel and North Carver Stations appear to have been identical with a distinctive deep-eaved roof, the generous overhang of which provided shelter above the station platform. Facing the tracks at each station was a bay window. Mount Carmel (East Middleborough) Station, Plymouth & Middleboro Railroad at Carmel Street, Middleborough, MA, photograph, c. 1900.From its opening in 1892 until its closure in March, 1919, Albert T. Savery had served as the station agent of Mount Carmel “with acceptance to both the company and patrons.” Savery was also a noted Waterville mill owner whose products found their way over the Plymouth & Middleboro line. Mount Carmel (East Middleborough) Station, Plymouth & Middleboro Railroad at Carmel Street, Middleborough, MA, photograph, c. 1920. 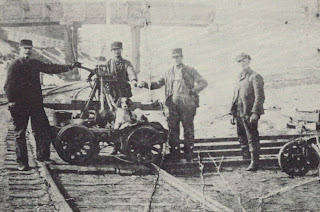 Plymouth & Middleboro Railroad Construction Crew, photograph, 1892, from Ellsworth C. Braddock, Memories of North Carver Village (Marion, MA: Channing Books, 1977), p. 11. In addition to Irish and Italian immigrants hired at Boston, local men were engaged to help construct the Plymouth & Middleboro Railroad. Here Jim Thomas, Arthur Goslin, Bill Thomas and Nelson Garnett pause from their duties to pose for the photographer, along with a spaniel who sits atop the handcar. The view is looking west towards the Plympton (North Main) Street Bridge at North Carver. 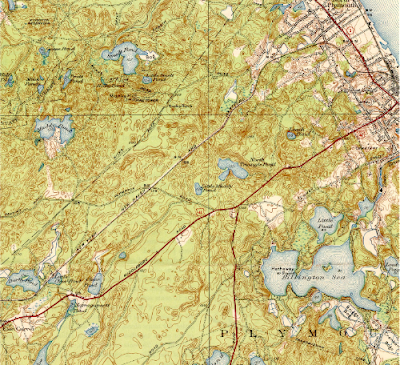 USGS Map, Plympton Quadrangle, detail showing Carver location of Plymouth & Middleboro Railroad, 1941. North Carver Station, Plymouth & Middleboro Railroad at High Street, Carver, MA, photograph, c. 1900. 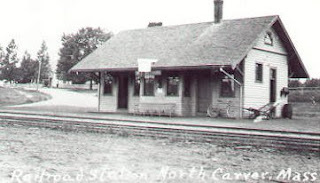 The North Carver passenger station stood on the north side of the railroad tracks. Here, High Street is partly visible in the background behind the station. Behind the trees at the far left was the home of Franklin Wilbur, a manager of the New England Cranberry Sales Company, which still stands at the corner of High and North Main Streets. North Carver Freight House, Plymouth & Middleboro Railroad at High Street, Carver, MA, photograph, c. 1910. 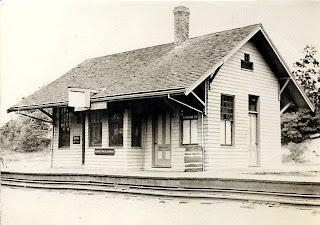 The North Carver freight house stood on the south side of the railroad line a short distance east of the passenger station. This view depicts the rear of the building where local freight such as milled lumber, box boards, cranberries, and other products were loaded into the building before passing out the oppposite end where the freight platform was level with the box cars. USGS Map, Plymouth Quadrangle, detail showing Plymouth location of Plymouth & Middleboro Railroad, 1939. Darby Station, Plymouth & Middleboro Railroad at Darby Pond, Plymouth, MA, photograph, c. 1900. Unlike the other three way stations along the line, Darby station appears to have combined the passenger station and freight house in a single building. Of the stations along the line, Darby was situated in the least populated area, and accordingly little passenger traffic was anticipated when the line was built. Much heavier receipts were received for the freight shipped through the small building, particularly after the Middleborough lumber milling concern of Clark & Cole located a mill nearby. Bradbury, L. Joseph. Old Colony Club 1769: A Biographical Journal of Its Past Presidents. Plymouth, MA: Old Colony Club, 1984. Braddock, Ellsworth C. Memories of North Carver Village. Marion, MA: Channing Books, 1977. Butler, Lyman, “An Unfinished Millstone”, The Middleborough Antiquarian, 5:2, April, 1963. History of the Old Colony Railroad. Boston, MA: Hager & Handy, 1893. Plymouth Illustrated: 1893. A Tour of Plymouth As It Was long Ago. Plymouth, MA: The Old Colony Club, 1993. Pratt, Ernest S., “Old Sawmills of Middleboro as I Remember Them”, The Middleborough Antiquarian, 5:4, November, 1963. Shaw, Constance Jenney and Amy B. Sheperdson. Images of America: Carver. Charleston, SC: Arcadia Publishing, 2004. Soule, Alberta N., “Valley Farm – Soule Neighborhood”, The Middleborough Antiquarian, 5:3, June, 1963. Washburn, Charles M., “Waterville and the Plymouth and Middleborough Railroad”, The Middleborough Antiquarian, 4:4, November, 1962. It's mind blowing that you were able to put all of this together since my Email to you on 9/29/09. This is why "Recollecting Nemasket" is my favorite Blog. I recall boxcars sitting on a siding on the left side of court street going north as you pass over the tracks as late as 1965.. Growing up in Carver in the 1980s, on Plymouth St, the "Old Railroad Bed" as we called it was basically the dirtbike superhighway from where the powerlines cross US-44 between Rt 58 and Rt 105, and the powerlines just west of the (Old) US-44/Rt 80 junction in Plymouth.